Get ready for Dalton's Second Annual *Hero Con*! 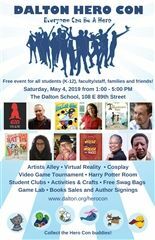 Pannels with incredible authors and illustrators, games and activities, free comics and more! For more information, visit the Hero Con website! FP families can now request access to their child(ren)'s Dalton account in order to checkout online eBooks and audiobooks through our Sora (Overdrive) platform. Parents can also request their own account to access our K-Adult materials. Please fill out this form to get account information. Instructions for downloading the app and accessing the "Dalton Library- First Program" on phones, Ipads and other devices can be found here. Or, you can contact a librarian at any time for assistance. Happy Reading! Once you have your account information, click HERE to access the Sora platform and begin checking out eBooks and audiobooks!